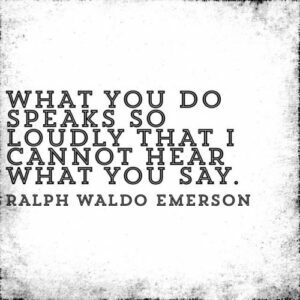 We often hear that actions speak louder than words. Have you ever sat back and thought about why that is? It is all about effort. It takes very little effort to say words. It takes effort to say the words, retain them, and then act upon them. You know that someone means what they say ONLY after they have made the effort to follow through. As I learned from a mentor of mine this year, when working with others, it is smart to go through the G.W.C. process: do they Get it, do they Want it, do they have the Capacity to follow through? It is also prudent to do the same for yourself when approaching a project or large goals. I also posit that INACTION speaks louder than words. Inaction can teach us about a person’s level of desire and faith in themselves. What a person does or does not do is not about you. Let me repeat this, what a person does or does not do is not about you. It IS about them. It is about their desire to follow through. It is about their faith in themselves and capacity to complete the action that they said that they would do. This is where having a coach is invaluable. We often overcommit ourselves (yes, I’m definitely guilty of this, too) because we want to help out, because we think we have the time and capacity, because we want to do that thing we said we would do. A coach helps to remind us of those goals that we SAID we wanted. A coach reminds us of the action steps we SAID we would take to reach that goal. A coach provides perspective when we are much too close to the situation to see the big picture. A coach helps us to focus on our priorities. In 2018, what are your goals? What are the action steps that you will take to move toward achieving those goals? Who will hold you accountable in taking those steps? In December 2018, I will have an online community of 500 or more participants. I will set up an account with an online community management system to create this community, post daily, host weekly 10 minute LIVE coaching tips, and once monthly Hot Seat interviews with a member of the community. In December 2018, I will have 64 or more clients that are participating or will have completed small group coaching with me. I will use Facebook ads, podcast interviews and networking to meet my potential clients. In December 2018, I will have 15 or more clients that are coaching with me individually. I will use my coaching with Master Connectors, Inc. to develop the skills and relationships to meet these clients. Each month in 2018, I will participate in self education to improve my coaching skills, my networking skills or personal growth. I will do this through participation in online webinars, completing a book each month, and workshops and conferences. I will launch at least one podcast in 2018. I will set up a recording schedule, sign up interviews with notable authors, coaches, experts in business and personal growth.